Henry C. Kendrick (1828-1894) was born in Bedford, New Hampshire, son of Daniel and Laura Lombard Kendrick. On October 27, 1858 he married Elizabeth Whiting a native of Boston at Boston. They first moved to Charlestown, Middlesex County, Massachusetts, where we find them listed in the 1860 U.S. Census. They moved to Hyde Park, Norfolk County, Massachusetts, listed in the 1870 U. S. Census. The Kendricks then moved to Quincy and lived at 66 Franklin Street, also in Norfolk County, Massachusetts. Kendrick was an entrepreneur, money & stock broker, revenue stamp, and specie broker in Boston active since the end of the Civil War. By 1865 he was selling Revenue Stamps or exchanged for torn or defaced currency and Greenbacks at the Traveller Counting Room on State Street. This was at the Boston Evening Traveller Building, which published a newspaper from 1845 until 1885. Among their tenants was Henry C. Kendrick listed as an American Bill Broker. In the 1870 Boston Directory he had a business partner, I. W. Elwell in the firm of Kendrick & Elwell, Fractional Currency & Bill Brokers, 31 State Street, Boston. In 1884, he was the proprietor of H. C. Kendrick's, 31 State Street, Boston, a Symphony Concert & Rehearsal Hall, where he sold seats, as well as his Specie & Bill Brokerage. 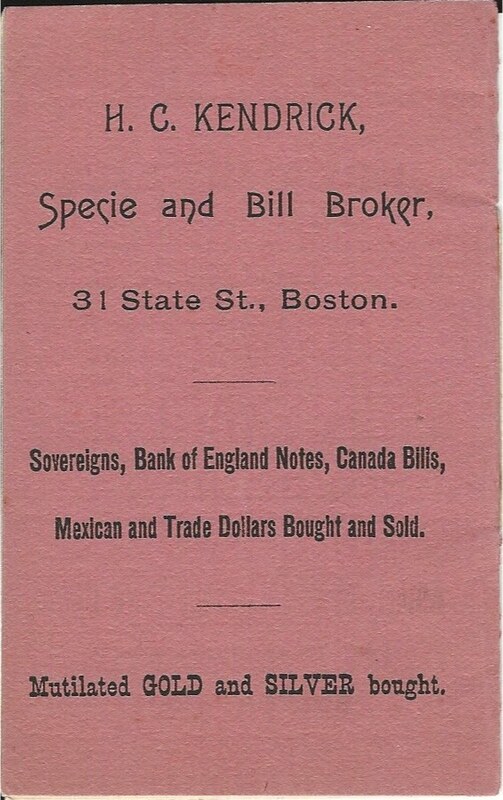 In the 1888 Boston City Directory he is listed as a Specie Broker at 9 State Street, Boston. Circa 1890 he relocated to 15 State Street. After his death the firm was renamed Kendrick's Money Exchange, and John P. Conroy was hired as the manager. By 1907 the firm relocated once again near the Easton Building, 9 State Street. The following year, 1908, the firm relocated this time to 218 Washington Street. By January 1910 the firm ran an advertising campaign in The Numismatistsoliciting that they bought and sold rare coins. Fig. 1. 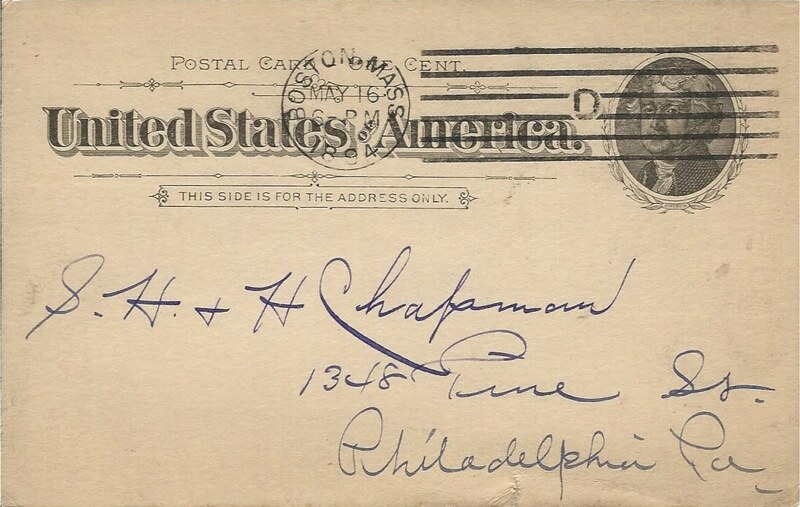 Front of "Postal Card" mailed to the Chapman Brothers by Henry C. Kendrick from Boston, Massachusetts on May 16, 1894. Kendrick died twenty-four days later. Fig. 2. 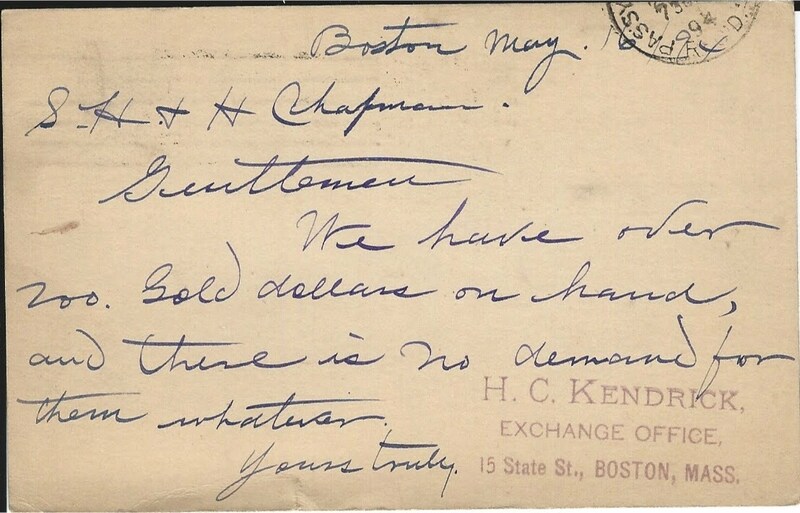 Back of "Postal Card" mailed to the Chapman Brothers by H. C. Kendrick from Boston, Massachusetts on May 16, 1894, with his hand-stamp. David Sklow, February 7, 2009, Lot 686, Lyman Haynes Low, Premium List (New York, 1899) 4th edition. Hand-stamped Kendrick's Money Exchange on back endpaper. The New England Business Directory and Gazetteer, No. XXIII (Boston, 1908) : 1413, column 3, "Specie"